Volunteers are at the heart of everything we do. 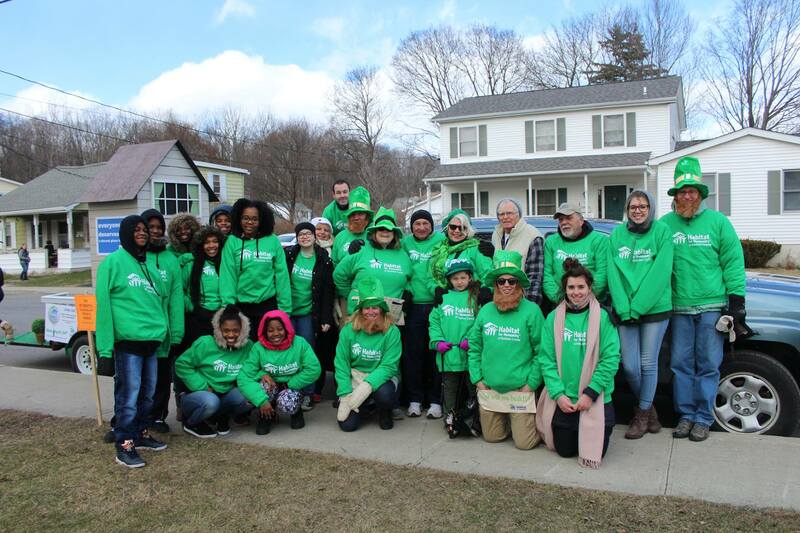 Thank you for your interest in volunteering for Habitat for Humanity of Dutchess County. We welcome individuals and groups from all walks of earth to work toward providing families of Dutchess County with quality, affordable homeownership. Without volunteers there would be no Habitat! There are plenty of ways for you to get involved. See different volunteer descriptions below. While we welcome volunteers with construction skills, we don’t require previous experience. We provide all of the training needed for the day, all you need is your enthusiasm and energy to lend a helping hand. Getting started is easy. You can simply sign up now, which gets you on our mailing list. You can keep current with our volunteer needs and jump in when you’re ready. Or you can select a date to volunteer now and jump in right away. If you would like to have more information, you can sign up for one of the Volunteer Orientations that we have scheduled on the calendar. Or you can EMAIL or call our Volunteer Coordinator to discuss any questions you have. New volunteers must register at the Volunteer Hub / Volunteer Management site (http://habitatdutchess.volunteerhub.com). By doing so, volunteer indicates acceptance and signature of Waiver and Release of Liability. This MUST be done prior to the first scheduled volunteer opportunity. A printable Waiver & Release of Liability form is available HERE. Volunteers must register for a volunteer opportunity. In order to plan and coordinate materials, it is imparative for the Build Captain or Event Coordinator to know how many volunteers to expect. Only those individuals who have signed up for an opportunity will be able to participate. If an individual is unable to make the day that he/she has signed up for, he/she should contact us as soon as possible. Volunteers should dress appropriately for the task. Individuals volunteering on the build site should expect to be working outside and should expect to get dirty. Wear sturdy shoes. No open-toed shoes are allowed on the build site. Volunteers not dressed properly may be asked to leave. Volunteers should arrive on time for their scheduled build day or volunteer opportunity. Individuals must not be under the influence of alcohol or any illicit drugs while participating in volunteer opportunities. For safety reasons and in accordance with Federal Labor Laws, we are unable to accommodate youth under the age of 16 on the build site, in the warehouse, or as a volunteer in the Habitat for Humanity office. 14 and 15 year olds are allowed to engage in Habitat for Humanity activities that are not on an active construction site. Such activities might involve painting, landscape and yard maintenance, and other non-construction tasks. 14 and 15 year old volunteers must come with adult supervision at the ratio of 4:1. Habitat for Humanity of Dutchess shall post such opportunities as they become available on the Facebook page, the Volunteer Opportunities Calendar, and emails. 16 and 17 year olds are allowed to volunteer on Habitat for Humanity work sites. Teens (aged 16 & 17) can do general carpentry, which can include activities such as hammering, putting in insulation, etc. They cannot do excavation, demolition, roofing, use power tools or work at heights above 6 feet. They must follow all rules pertaining to hard hat use, height requirements and power tools. ALL volunteers that are on the worksite are required to sign a waiver. A separate waiver is required by all persons 18 or under and must be signed by the volunteer and their parent or legal guardian. Printable waivers are available HERE. Individuals over 75 years of age are not allowed to do any work that requires leaving the ground – i.e. — any work that requires climbing or using a ladder. They should not work unaccompanied or lift or carry materials that weigh more than 25 pounds. Care should be taken when lifting any objects. All volunteers under 18 must be accompanied by an adult!For safety reasons and in accordance with Federal Labor Laws, we are unable to accommodate youth under the age of 16 on the build site, in the warehouse, or as a volunteer in the Habitat for Humanity office.